Australia is a beautiful nation which is known for its natural scenic beauty, picturesque landscapes and wide variety of exotic flora and fauna species in its dense forest cover. Since time immemorial, Australia has enthralled people with welcoming and enticing opportunities, both in terms of work and study. This stupendous nation has a lot to offer to people who wish to immigrate to Australia in terms of better living standards, greater social benefits and higher economy. 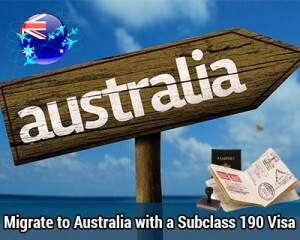 The Australia skilled nominated visa is a permanent type of visa category which requires the applicant to be nominated by an Australian state or territory government. This visa type allows an individual to live indefinitely in Australia, along with full work rights. As a general rule, you would be allowed to stay in the state or territory which nominated you, for a period of two years. This visa can be acquired by first lodging an Expression of Interest through Australian SkillSelect. The applicant then receives a letter of invitation from the Department of Immigration to apply. On receiving this invitation, the applicant must apply within 60 days or else the invitation ceases to exist. As stated earlier, you must be nominated by an Australian state or territory government which comes up with a list of occupations in short supply in their area. This is nothing but the Consolidated Skilled Occupations List (CSOL). If you meet their specific requirements in terms of English proficiency and wok experience, you stand a good chance at nomination by their government. Find more immigration and visa updates follow MoreVisas at Facebook, Twitter and Google+.